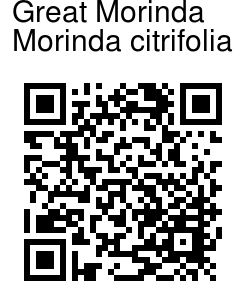 Great morinda is a shrub or small tree native to Southeast Asia but has been extensively spread by man throughout India and into the Pacific islands as far as the islands of French Polynesian, of which Tahiti is the most prominent. It can also be found in parts of the West Indies. The plant grows well on sandy or rocky shores. Apart from saline conditions, the plant also can withstand drought and grows in secondary soils. It can grow up to 9 m tall, and has large, simple, dark green, shiny and deeply veined leaves. The plant flowers and fruits all year round. The flowers are small and white. The fruit is a multiple fruit that has a pungent odor when ripening, and is hence also known as cheese fruit or even vomit fruit. It is oval and reaches 4-7 cm in size. At first green, the fruit turns yellow then almost white as it ripens. It contains many seeds. It is sometimes called starvation fruit. Despite its strong smell and bitter taste, the fruit is nevertheless eaten as a famine food. 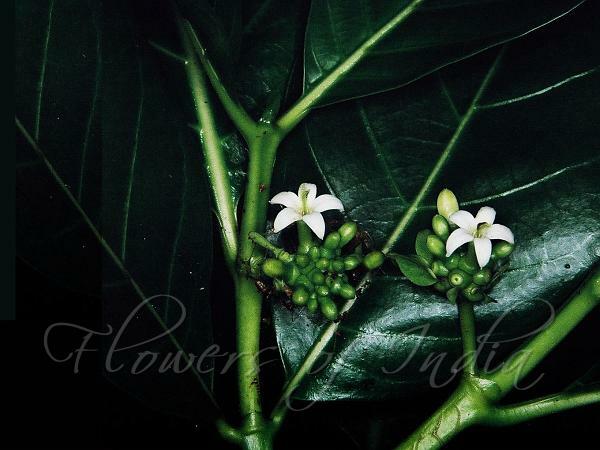 Medicinal uses: Scientific studies have investigated noni's effect on the growth of cancerous tissue. One such study found that noni inhibited and reduced growth of the capillary vessels sprouting from human breast tumor explants and, at increased concentrations, the noni caused existing vessels in tumors to rapidly degenerate. Identification credit: Navendu Pāgé Photographed in Maharashtra.